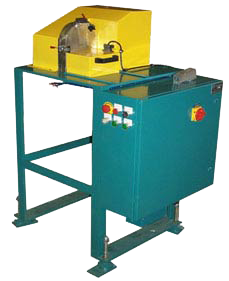 Sliver slitting saw used to cut a thin sliver from a rubber extrusion for viewing the profile on a magnifying screen. Precision cutter utilizing a stepper motor and vision system to precisely locate a molded detail prior to cutting the product to a finished length. 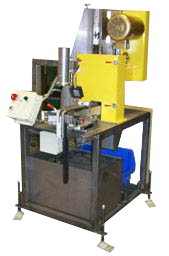 Servo controlled feed, cutting and product take-away. Checks product for length prior to ejecting. Quick change tooling, easy access, operator friendly design. 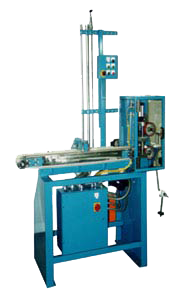 Rubber or Plastic Extrusion Cut-To-Length Extrusion Cutter : Extruded rubber profiles are fed via a pinch wheel puller through an air cylinder cutoff knife. 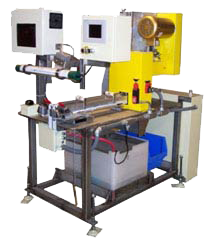 Utilizing a PLC precision lengths can be preset and cut into batch quantities. 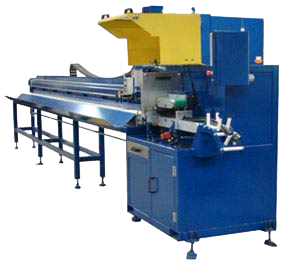 Silver Saw: Used to cut extrusion cross sections for product inspection.